Great fuel efficiency and cooking speed at a cost of increased bulkiness and weight. These pots were replaced once more in Primus model line by Primetech pots of 2nd generation (with removable handle). slightly better proprietary handles with lock feature. In summer 2016 I purchased two Primus Primetech pots (1.0 and 1.8L), but due to seller error I had to send back the smaller one and purchase an older 1.0L ETA model in local store. They are almost the same. Both Primus pots are stackable, each of them comes with mesh storage bag, transparent plastic lid, and convenient red plastic bowl designed for protection of inner coating of the pot on the trail (later I discovered that this bowl actually destroys the coating, more on this later). I don't like the plastic lid as it’s bulkier and weighs the same (which is strange) as the metal lids on my old pots. But it's good for draining the boiling water from the pot — you don't have any chance to get burned. 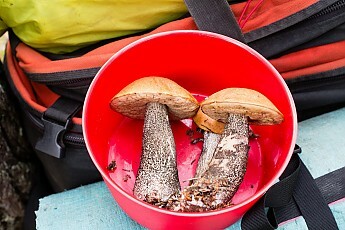 The non-stick feature greatly simplifies the cooking in backcountry, where it’s difficult to clean the cookware thoroughly. 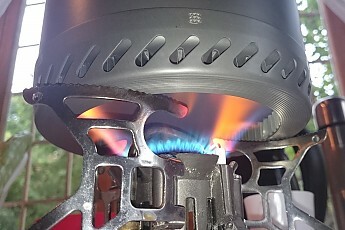 Note that these pots are not compatible with stoves which have too wide flame pattern — the flame shall fit inside the heat exchanger. 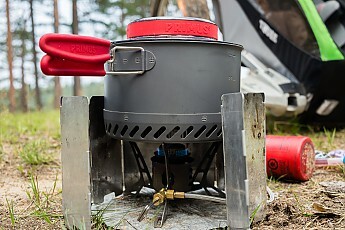 Also the stove legs shall either fit inside the heat exchanger (in case of ultralight stoves) or be wide enough to support the pot without risk of falling. These pots are also poorly suited for cooking on electric appliances due to tiny contact area. We faced this problem when we rented a cottage during one of our trips. But the cooking was possible nevertheless (at slow speed). 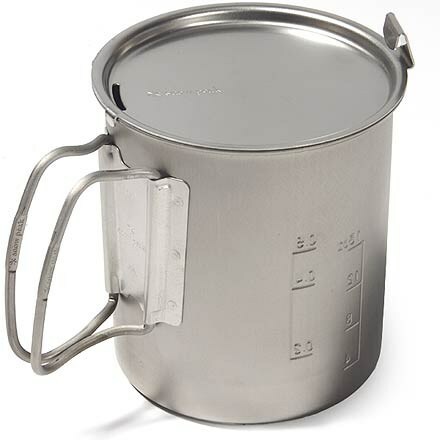 I measured the boiling time improvement in comparison to my old aluminum and stainless steel pots (1.0L and 1.5L respectively). In various measurements on constant power (approx. 1.5 kW) I've got about 40% improvement in speed/efficiency. On higher power settings this value will decrease. So the heat exchanger improves the efficiency really well. 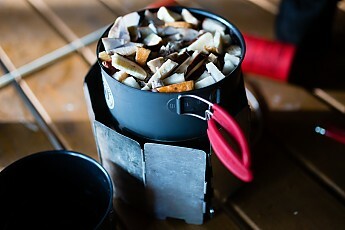 This is especially important in winter trips, when you have to melt lots of snow and ice to get the water for cooking. Also the cooking in general becomes much faster, the heat pattern on the pot bottom becomes uniform, without a pronounced hot spot which leads to burning the food. 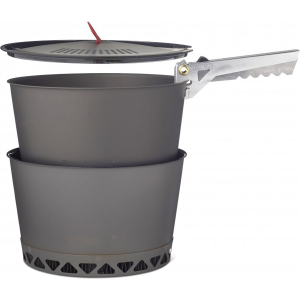 The pots themselves are bulky and heavy (even the steel pots are lighter), so in short trips you won't get any weight advantage over traditional pots. To my opinion, such advantage will appear only in cases when you need to carry more than 1 kg (2 lbs) of fuel at once. It was difficult to me to re-pack my cookware for optimum space usage because of bulkiness of these new pots. 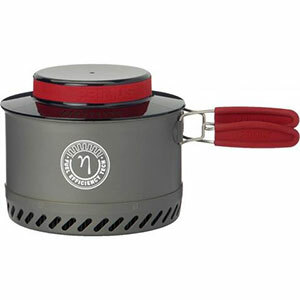 The 1.0L pot is too shallow for placing the compact hosed stove inside without leaving the protective bowl at home. At the first look, the ceramic non-stick coating of these pots looks very hard and durable. The smaller pot experienced a violent crash on hard surface with various cookware inside it (the pot was even ovalized slightly in the crash), and the coating got only a minor scratch on the pot edge, where it hit the concrete floor. Nevertheless I try not to scratch the coating with metal and use the plastic cutlery when possible. Soon after purchasing I noticed that the plastic lids are not 100% thermally stable, and my 1.0L lid became slightly deformed despite the cooking on low to medium power settings. Do not leave it tilted when the water is boiling! After a year of use the 1.8L lid has got numerous cracks under the red silicone band (only on bottom side of the lid). It still holds, but I contacted Primus, and they shipped me replacement lids for both pots. But the replacement lid has started generating these cracks again. I don't know the cause of this problem. After a year of use the ceramic coating on larger pot has got visible scratches slightly below the pot edge, where the edge of plastic bowl touches the pot walls during the transportation. This kind of damage looks unavoidable in bicycle touring on bumpy roads. In general, these are good pots, if you can live with increased bulkiness and weight. Even the price is quite fine, as you get the ceramic coating on the pot and the plastic bowl in the kit. Considering all advantages and disadvantages, in autumn 2017 I decided to stop using these pots in regular summer weekend trips, as they are too bulky, and have limited service life. I purchased a set of stainless steel Primus pots for this purpose. The Primetech and ETA pots will remain in service for winter and multi-day trips, where great fuel economy and increased boiling speed have the priority. Great review and pictures, Vladimir! Thanks for reviewing this newer pot version and explaining the changes/updates. 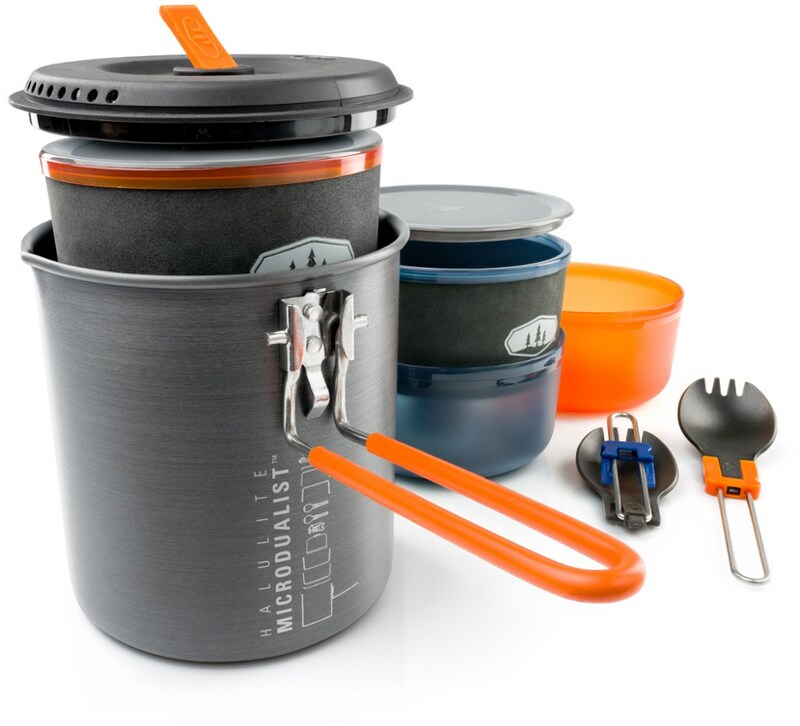 I've updated my review - I became tired of limited service life of these pots, and I decided to continue using them only in winter and multi-day trips. Thanks for the update, Vladimir. I hope the new SS Primus pots are working out. Have I ever told that the Primus company has the best in class warranty service? They've shipped various replacement items to me three times by now! 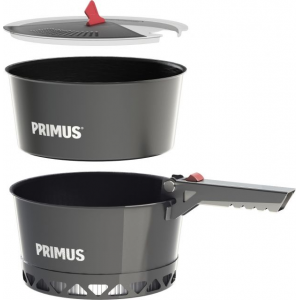 They TRULY stand behind their products, and thus the Primus equipment has the top priority in my "wishlist". 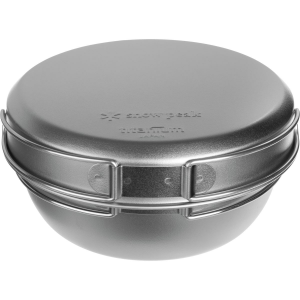 By the way, the S/S cookset by Primus is gorgeous! I must make a review as soon as I get enough experience. 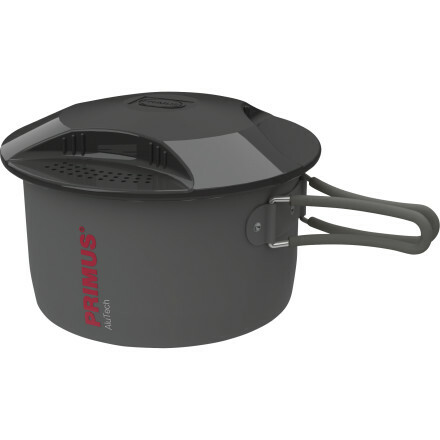 The Primus PrimeTech Pot is not available from the stores we monitor. It was last seen June 21, 2018	at CampSaver.com.